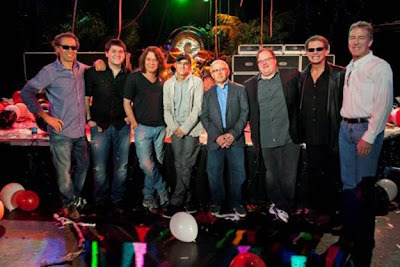 Van Halen have signed with Interscope Records. A new photo (below) taken Monday at The Roxy in Los Angeles, features VH with the Interscope management team. The new deal marks the first time in the band’s career that they won’t be on Warner Brothers. Early rumors reported that VH were to sign with Columbia Records (Sony), but things changed very late in the process, according to The Hollywood Reporter. An insider told the media website that the contract for the Sony deal was drawn up and approved, but hadn’t been signed, when Universal Music stepped into the picture. In addition to the last-minute label positioning, the VH management structure complicates things, as David Lee Roth has a separate management, legal and accounting team than the other three members of the VH family. The main issue for Roth? He was apparently adamant about being on a west coast label. "He was never on board [with Columbia]," said the source. "It was as complicated as anyone would imagine, when one side says black, the other says white. The label was pretty skeptical that things would work out." Although no details have been announced, the new VH album is rumored to be released in February 2012. Alex Van Halen; Wolfgang Van Halen; Eddie Van Halen; Jimmy Iovine, Chairman, Interscope Geffen A&M Records; Irving Azoff, Executive Chairman of Live Nation Entertainment and Chairman and CEO of the Front Line Management Group; Steve Berman, Vice Chairman, Interscope Geffen A&M Records; David Lee Roth; and Jim Urie, President and CEO, Universal Music Group Distribution.